Can you think of a celebrity with his or her own line of tea? No? The next time someone asks you that question – which I’m sure happens all the time – you can answer Oprah. 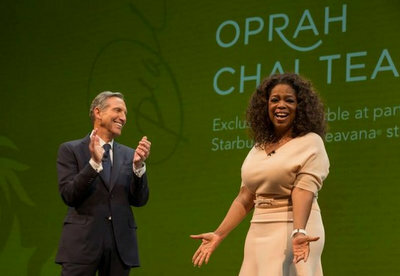 Oprah has teamed up with Starbucks’ premium tea brand, Tevana, to create her own line of chai tea. The partnership was announced at the Starbucks annual meeting last week. Oprah is the first celebrity – and a very big celebrity at that – to really align herself with a Starbucks brand in this way, and Teavana is the first brand that she has aligned herself with so directly. “I looove tea,” said Oprah Winfrey. “My daily tea ritual is a vital part of my morning. Savory and spicy chai, with its deep flavor, has long been a favorite of mine. When Howard Schultz offered to have me come into the Starbucks tasting room and create my very own tea blend, I thought that sounded like such a unique opportunity and fun to the tenth power. Oprah herself created the tea blend Teavana’s head teaologist, Naoko Tsunoda. It has a base of black and rooibos teas, with spices that include cinnamon, ginger, cardamom and cloves. It will be available as a loose-leaf tea and as a tea latte at Tevana stores before for Mother’s Day, so you can start looking for it in a few weeks. Proceeds from the sale of the tea will go towards the Oprah Winfrey Leadership Academy Foundation, which provides funding for the Oprah Winfrey Leadership Academy for Girls – South Africa and is dedicated to helping its graduates attend colleges and universities. The foundation will support additional youth education through Girls Inc., National CARES Mentoring Movement, Pathways to College and the U.S. Dream Academy. You can find out more details of the tea’s creation and these charities at Steep Your Soul.